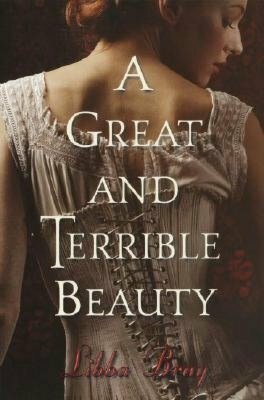 Reading A Great and Terrible Beauty by Libba Bray, I knew I was going to get a page turning ‘corset drama’ about young women at a Victorian boarding school in England who dabble in the Occult; what I didn’t know I’d get, was a fairly sensitive articulation of the complex struggles that girls entering adulthood had to face in that era, a time obsessed with constraining and controlling its women. The story follows the adventures of Gemma Doyle, a 16 year old prone to visions of the future, as she is whisked off to a classic British boarding school, after her mother dies tragically and mysteriously in India. At first Gemma, thinks she is getting what she always wanted: a chance to fit in and make friends with other girls her own age, instead of spending time exploring markets in Bombay or learning about local legends from her bohemian mother. However, she isn’t prepared for the new life of constant judging, popularity contests and blackmail as a means to friendship, all while being groomed for the sole purpose of becoming a fashionable accessory on the arm of a wealthy husband. What separated this book from other high school melodramas was the historical setting, and the bond that Gemma forms with three other young women. They don’t become friends simply to top other cliques at school, their friendship is formed from a necessity to tell the truth and to be honest with each other; claiming human needs that were reserved only for men. Don’t get me wrong, this book is still full of gossip, the occasional social backstabbing, and angst that has become the appropriated language of adolescent girls vying for what limited power is offered to them, but a genuine relationship built on trust and a dream of a greater life beyond a repressed marriage unites Gemma and her friends. The other twist which made this narrative so engaging was the introduction of a power that Gemma has inherited that enables her to enter a magical place between worlds known as the Realms. It is a magic that comes with great responsibility, a power that has been shepherded by an elite group of women through out the ages. This reference to ancient godess religions and myth surrounding the sacred feminine was a great example of the hard hitting research that Bray did to enrich her story, grounding it in a startling past, while keeping the characters fresh and relatable. I look forward to seeing how Gemma uses her supernatural abilities to develop a greater sense of self worth as she and her friends struggle towards independence in a time that may feel buried in the past, but shares strikingly similar expectations with our own day and age. It is certainly a story worth sharing.